Carraig House is a beautifully located modern house set amidst the most breathtaking scenery in Ireland. 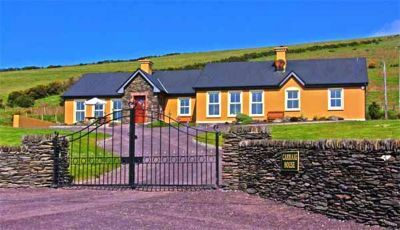 Carraig house is about a 25 minute walk (1.1 miles) away from Dingle Town yet it is in a lovely secluded and tranquil location (away from the hustle and bustle of the Town!) The sitting room is very comfortable. There is 50 inch flat screen television in the sitting room with satellite channels including Sky Sports. Bedrooms are large and beautifully appointed with wonderful views of the sea and mountains. There are 7 bedrooms in all, accommodating up to 18 people comfortably. This is the ideal property for a large family or perhaps 3-4 families going away together. Carraig House has 6 X spacious double rooms; Main house; 4 double room with two ensuite, one twin room, one single fold out bed, one double fold out bed & two bathrooms. The garage which was converted to an apartment has one double room, one triple room & one bathroom.